What is a Cappuccino and What’s in it Anyway? Fast cars have been named after many things from adjectives for strength, weather patterns and geographical landmarks even icons of mythology. Very few have been named after beverages. This speaks to the impressive engineering of the people at Suzuki or perhaps to the integrity of the drink which inspired the Japanese automobile. Either is fine, but today, the name cappuccino is more synonymous with the bold and high concentrate coffee drink than the Japanese roadster. 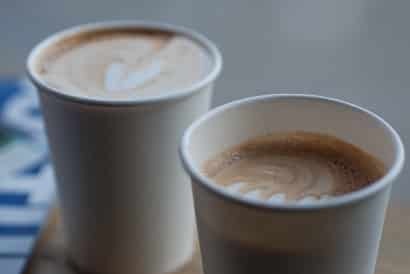 Since you’re well aware that we’re not discussing sports cars here then a coffee expert should that the beverage itself is an Italian coffee drink that is traditionally prepared with double espresso, and steamed milk foam. What does the name cappuccino mean? Well, it’s a drink with a long history. Named after the Capuchins, a unique Catholic religious order whose first rules featured the growing of natural, untrimmed beards. But the beards had little to do with the drink. The color of the robes, or habits, worn by the Capuchins did however. This began in the 1940 in Italy, and there is some speculation that the Viennese imparted the word on this ancient drink when they first came across the robed priest order. The German language attempts to dispute this history though. Their word, ‘Kapuziner’ is mentioned as a coffee beverage in the 18th century in Austria. Their version is slightly different but it’s interesting to note that the word is so similar. The recipe for Kapuziner is described as coffee, okay we can agree there, then with sugar, egg yolks and cream. This version is recorded in dictionary entries as far back as 1800. Kapuziner, as it is referred to, a common coffee drink in cafés in the parts of northern Italy during the First World War. All this etymology is getting us somewhere: It’s interesting to note that while Espresso comes from the Italian word that means “pressed-out”, explaining how the coffee drink is made and macchiato means “coffee with a spot of milk”, Cappuccino still refers to something entirely different. Though the beverage predates refrigeration, the use of full cream is the method of our ancient baristas. So, a ‘Kapuziner’ was made with a very small amount of cream to get the ‘capuchin’ color. 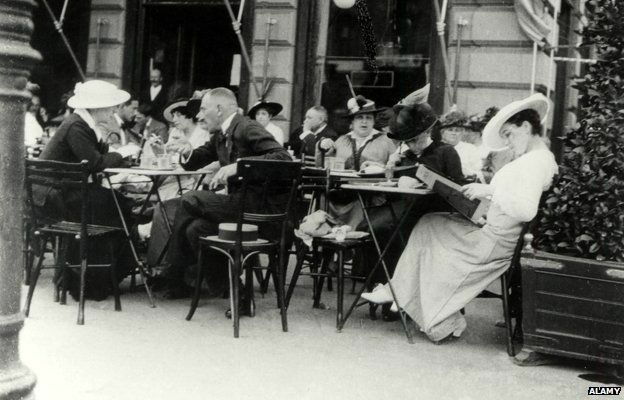 Post-World War II, the cappuccino had a bit of a revolution in Italy. The prevalence of better and more widely available espresso machines brought the country into the so-called “Age of Crema”. In England, the first major form of espresso was the cappuccino. Coming form Italy was an easy transition because the Brits were already drinking coffee with milk beforehand. However, the distinct texture and the cafe culture of the cappuccino set it apart from regular coffee with milk. Today, ‘Kapuziner’ is an ever popular beverage in the Viennese cafes, but the drink also see worldwide fame, Starbucks makes their own version and India has it’s own infatuation with the beverage, both in hindi and urdu, कैपुचिनो and as کیپچنو, respectively. There are plenty of variations on this style, and many hold up on there own. The modern day cappuccino beverage has become a favorite of enthusiasts of caffeinated beverages. Great cappuccino is possible with some practice, water, steam and foam. you’ll also find that good equipment really enhances the process. You’ll want an espresso machine with steaming wand, or a simple coffee maker with a steamer but also, quality coffee beans on hand. Steam the milk. Easy if you’ve got an espresso machine with a steam wand, but if you’re without, heat a cup of milk in a saucepan over medium heat. Don’t scald. Let the milk simmer until bubbles form around the edges, but don’t let it get to a boil. Grab an electric mixer or for a real workout, get a large whisk. Whip the milk, increasing speed as the milk begins to thicken and until you get the desired volume of froth. Now, make the your espresso. You can use many different techniques to get this, but the idea here is to get a small amount of hot water through some great beans while retaining the most important favors. If you don’t have an espresso machine, it is suggested to use a Stovetop Moka Pot, or it’s even possible to use an Aeropress (which is going to produce a very different product than a french press would). Now combine! A cappuccino calls for equal parts espresso, steamed milk, and foam. 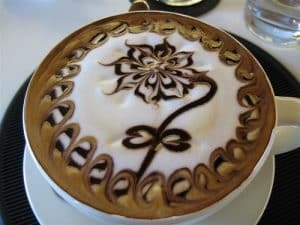 Combining with other ingredients or with different ratios will give insight into other drinks in the Cappuccino family. In a similar naming process to the Cappuccino, the Italian macchiato means “spotted”, which translation brings caffè macchiato to “spotted coffee”, or coffee with a spot of milk. The origin stems from barista wizards needing to communicate the difference between an espresso and an espresso with a tiny bit of milk in it to serving waiters. The macchiato was then born. The concept is reflected in the Portuguese name for the drink: café pingado, meaning coffee with a drop. Since the caffè macchiato features a single drop it has the highest ratio of espresso to milk of any of the drinks in this family. However, with the rise of coffee shops in America, Starbucks and the lot have popularized two sizes: solo and doppio. A solo contains one shot of espresso and a doppio has two. Good lingo to know if you’re out and about needing a caffeine fix. Now this still follows the rules by ratio but they’ve also begun to add caramel and other sweet additives to the drink. A real challenge it must be to get caramel to float. Though Starbucks has featured the machiatto since their inception more than thirty years ago, and they’ve created quite variety, including the latte machiatto, you can still make these beverages at home with your own refined palette. Obviously a better Machiatto isn’t dependent on hokey candy-based additives. Good coffee is about good roast and beans. So let’s walk through the steps and you can decide what variable to adjust in your practice. First, let’s get everything cleaned and ready for use. Wether you’re working with a professional or home espresso maker, the portafilter needs to be clean. Next, you’ll want to grind your beans for espresso, if you’ve got a burr grinder, or perhaps you’re comparing burr grinders, know that you’ll require a fine grind closely resembling sea salt. Let’s say you don’t have a good grinder, well we have a solution for that too. 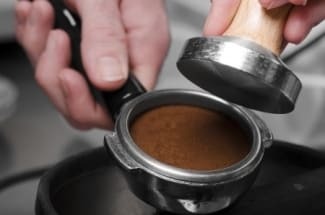 Fill the clean portafilter with the freshly ground coffee making sure to evenly distribute the grounds and then tamp them down lightly to compact them. This is a key step for espresso. Now let’s say you don’t have access to a professional or home espresso maker, you can use a stovetop espresso maker but the product will vary slightly, and not necessarily for better or worse, just different. Pour the grounds into the inner basket and spread them around evenly with your finger, then tamp them down. Use strong coffee in place of the espresso if you don’t have any means of making proper espresso. You can find a slew of ideas for strong coffee here. Once you’ve finished creating your espresso shot, stir to distribute the crema, which is the foam that builds up on top. This is key for creating the machiatto and should be mentioned that the greater the extraction from the beans will provide better results, because the crema is produced by the oils released during intense pressure. Now we’ve got to make the milk aspect of the drink. Coconut or almond milk can be experimented with but experts warn that these are easier to scald. If you don’t have a steam wand, perhaps you’re not using an espresso maker for this project, then here’s a brief rundown on how to get the right consistency, and what the different terminology means. Foaming: The experts will always say, properly prepared milk is always foamed. If the end product isn’t incorporating foam, you’ll still want to have some air added into the milk. This is because air improves and sweetens the taste of milk. Milk that has not been foamed at all tends to taste flat and dull by comparison. Frothing: This is where the substitution comes in. If a steam wand isn’t available or in the current budget, try this. Pour your milk into a jar, preferably something with a good seal like a mason jar. Don’t fill more than halfway, there needs to be room for plenty of air to mix and create foam. Seal the jar and shake until the milk is frothing or visually seems to have doubled in volume. Steaming: This is where you can use some of the non-dairy alternatives to make your Machiatto. Heat almond milk or what have you, in a microwave for 30 seconds or in a small saucepan on the stove just until very warm. Submerge whisk into the milk and proceed to stir moving from top to bottom so air is incorporated. This could be a timely procedure, but work fast as the heat is an integral part of this procedure. The proteins that make milk functional as a food source are primarily what reacts and changes when steam and heat is added to the liquid, and understanding that is key to mastering the perfect texture. Even coffee making requires a little chemistry knowledge. Can you Make Latte Art With Cappuccino? If you’re a beginner in the latte art department, then a cappuccino is probably not the best starting point. This is possibly due to the fact that the amount of froth in the cap will probably cause the milk to be too thick to pour with. Start with your milk texture. You want milk texture is suitable for a latte or maybe even a flat white. Correct micro foam will be combined with the milk and thus, will not float directly on the surface. The surface will appear shiny still and have the consistency of cream. For an art-plausible pour this is the most important part. Crema, despite its value as a deliverer of oils and flavor, can be your enemy in the latte art game. If your beans are too fresh, it can be a bit difficult to cut through. Try swirling your cup or breaking it up a bit with your milk since you won’t start pouring immediately. Now once you’ve got your milk texture right, a good way to start is with some basic shapes. It can be useful to have a metal pitcher with a needle nose spout, or really any metal pitcher with a pronounced spout. Now it’s time to pour and create some basic art shapes. A basic dot in the middle of your froth. As you get to the top of your cup, tilt your jug a bit more to let the foam push the crema out of the way. This is a helpful pour to learn if you’re interested in making different kinds of machiatto style drinks. Basic heart. Same as the dot. But instead of just stopping the pour, push through the dot and slow the pour down quickly as you go along. Once the dot is overcome then you can begin to form the bevels of the heart shape. Layered dot or layered heart. Starts like your basic dot. But as you increase the pour rate, wiggle your jug left and right smoothly. This will pull coffee in between the layers of the milk. Then stop pouring or follow through slowly as explained in the basic heart shape. The Rosetta. This is probably the iconic latte art pattern. This uses the skills of your layered heart. But you start your pour from the back of the cup with relatively large wiggles, then start to pull back and make your wiggles smaller. This gives you the curls at one end of the cup and the tapering “leaves” at the other. To finish, pull through like a heart. Other patterns are then variations on these themes. And some combine free pouring with the technique called etching, which is probably your best bet if you’re going to expert level portraits like the one seen above. Cappuccinos are a coffee drink well worth mastering and experimenting with. Just make sure you have the right gear before the caffeine crash comes! Ground Coffee Storage: In the Freezer, Fridge, or on the Counter?